50 x Original Heavy Duty Concrete & Brick Fixings. Heavy duty version of the common wall plug. It's durable construction makes these fixings ideal for outside use. 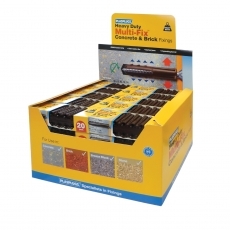 50 x 20 strips of Original Heavy Duty Concrete & Brick Fixings in a retail display box. Heavy duty version of the common wall plug. It's durable construction makes these fixings ideal for outside use. 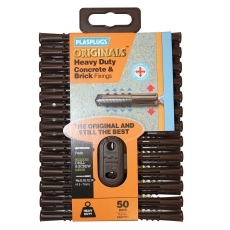 60 x Original Heavy Duty Concrete & Brick Fixings (6 strips of 10 fixings). Heavy duty version of the common wall plug. It's durable construction makes these fixings ideal for outside use.